I'm looking at this tutorial and I don't understand why he used such big resistor for his circuit. 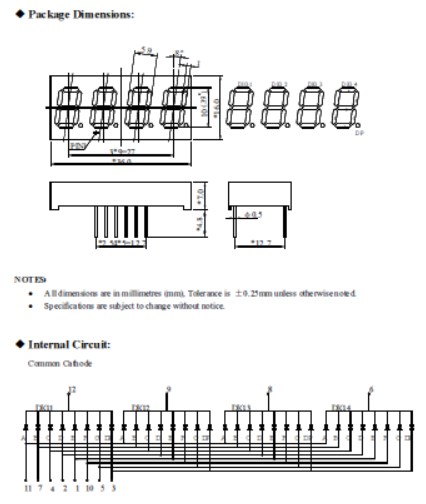 It says in the 4 digit LED schematics that the led has the forward current If = 20mA and the forward voltage of Fv = 2.5 V. If I want to hook it to my RPI GPIO pins, I know that the max current that a GPIO pin is 50mA (correct me if I'm wrong) and DC of 3.3V. If I do the ohms low I get from (3.3V - 2.5V) / 0.02 A = 40 Ω. So in my opinion I should use 40 Ω for the anode pins of the LED . Why he used 220Ω ? Why he chosen that specific transistor? And Why he added to that transistor a 4,7k Ω resistor ? I know the transistor has a collector, emitter and a base. To open the connection on a NPN transistor you need to apply some voltage through the Base. I need to hook up the emitter to ground and the collector to the cathode of the 4 digit led component. I know I should probably use a NPN transistor but would it matter if I use a PNP instead? I understand that the circuit changes, active high instead of active low, but are there any drawbacks to PNP over NPN? Please correct me and explain what physics theorem I should use in order to compute and know exactly what I need in order to make this project possible. First of all, you had some basic concept wrong. When an LED is on, the voltage between the anode and the cathode of the LED is minimum, only about 0.5-0.7v. This is why the tutorial said that the 200ohms give a readout of 12.8mA. (3.3-0.5)v/220ohm is about 12.7mA. What kind of transistor to be used depend on the logic of the circuit that you need and how you design your circuitry. In this case, The LED has a common cathode connection, and it need to be driven to GROUND (0v) when a signal (a positive voltage) is applied at the base of the transistor so that the transistor can be 'switch on' (i.e. the resistance between collector and emitter are minimum), therefore NPN make sense for this application. Also, I don't believe you can get 50mA from a (single) Pi i/o pin == last I looked it was more like 5mA..
Not the answer you're looking for? 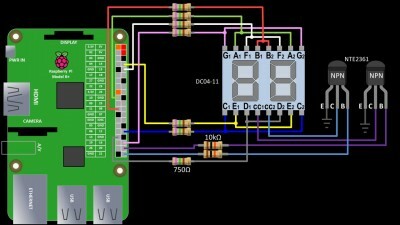 Browse other questions tagged gpio display led or ask your own question. Why did my Raspberry pi blow up? Why do LED lights need resistors?